The roaster has three parts: the chaff collector on top, the roasting chamber and the heater base. Start with three level scoops of green coffee (about 3.4 ounces by weight). Toggle the heat setting to ON. Set the timer for 5 – 9.9 minutes. You may add time at any point by hitting the UP button. As coffee beans roast they will begin to brown, double in size and separate from there chaff, emitting a light audible crack, this is called “first crack”. Now you’re starting to watch for your desired roast. We recommend a coffee roast that is dark brown, right before second crack, when the beans turn from dull/flat color to having a slight sheen on the exterior; this is a full-city roast. If you see oil on the surface, you are into the second crack.“Second crack” occurs when internal bean oils and moisture expand from an exothermic reaction, producing a small hole on the bean and emitting a light audible crack similar to popcorn popping; this is the start of a dark roast. If you see smoke coming from the roaster you are getting into the second crack and at a dark roast, if you’ve gotten to this point you want to hit the COOL button. After the cool cycle shuts off, remove the chaff collector (be careful – the roaster is still pretty warm), lift out the roast chamber by its handle and dump the beans. You should dump the freshly roasted beans in a glass or ceramic bowl and let them set-up for a day or two before putting them in an air tight container. We like to store the set-up roasted beans in a small canning jar. The only cleaning necessary is to dump out the chaff from the chaff collector and wipe the collector out, I use a small basting brush to clean. This model yields about 28 cups per batch. What if I am not getting an even roast? Certain coffees are denser and require help mixing to produce an even roast. Within the first 2 minutes of the roasting process hit the COOL button to kick the roaster into the cool mode for 30 seconds, next switch the heat control to OFF, then back to HEAT. As the coffee starts to roast again, you will have proper mixing. What if your roasts are too dark or too light? Batch size is critical to the roasting process. In all air roasters smaller batches take longer to roast and larger batches roast faster. It may seem counterintuitive, but hot air flows more freely with fewer beans giving less chance to build up heat in the chamber. If your roasts are too dark decrease your batch sizes to increase air flow. If your roasts are too light increase your batch size to increase trapped hot air. 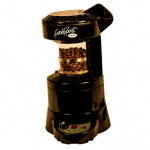 Go to the Fresh Roast SR 340 product page for information on pricing and current deals.